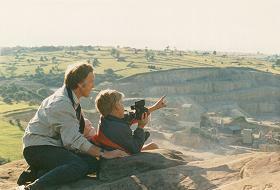 I first became aware of the C&HPR in the late 1950's during family outings to the Derbyshire Peak District. Here was a favourite picnic site near Cromford (1), at Black Rocks (2). Between two of the amazing cable hauled inclines at Sheep Pasture (3) and Middleton, shunting was conducted by a tiny Kitson 0-4-0 saddle tank 47007. The very picturesque area overshadowed by the giant rock formation made the line look like a model railway. Once when trying to observe the action at Sheep Pasture I met the local railwaymen who were concerned that this nosey young lad should not get in the way, but they were kind enough to keep me out of mischief and show me into the winding house. My abiding memory is that I had wandered into a working museum and not a fully operational railway system. I also remember the masses of grass snakes that were slithering around under the winding machine in the areas warmed by the steam boiler. Only a short bike ride away from Black Rocks a minor road took a parallel line to the C&HPR from Middleton Top (4). From this vantage point the spectacle of the assault of freight trains up the famous Hopton Incline (6) could be viewed. This incline, for a short section at 1 in 14, being the steepest gradient climbed by adhesion on British Railways. 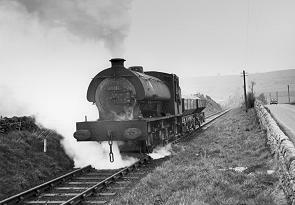 In the late 1950's it was worked by 58850, an ex North London 0-6-0 tank of the Victorian era. Fortunately this locomotive is now preserved on the Bluebell Railway. The C&HPR was opened in 1830 from Cromford to Whaley Bridge, some 33 miles. The railway with its corkscrew curves has been described as "being laid out by a mad Archimedes endeavouring to square the circle". The C&HPR was built in a similar fashion to that which would have been followed if a canal had been constructed. Along the line there were several steep inclined planes, worked by stationary engines with continuous cable. Therefore it was something of an anachronism that in the 1960's, with the new motorways, diesel power taking over from steam on the main railway lines, and Beeching closing lines everywhere, that this branch line still operated very much as it had for over 100 years. Although I could cycle from my home in Allestree near Derby to Middleton Top in a reasonable time, the steep uphill climb of the last mile or so made me question my sanity - only to be rewarded at the end by the sight and sounds of this wonderful line and the fantastic scenery through which it travelled. The enginemen at the C&HPR were not bothered by too many enthusiasts in the early 1960's, as the line was very much in the wilds especially in the winter. I was often allowed to climb into the cab of the engine at Middleton Top, which was usually one of a small batch of J94 0-6-0 saddletanks allocated to Buxton. However, a ride on the locomotive was strictly out of bounds. © John Neave. All rights reserved.